Do you have a Macbook with an Apple Music subscription? You would know that Apple Music content is in M4P format which only iTunes can play, not even VLC. So all your effort you put in sharing the downloaded music among other devices or with your friends shall be futile. But the Mac M4P to MP3 converter lets you do it, all at once, with so much ease, in the legal way. If you like the review, feel free to Like and Share. With piracy reaching out to the peaks, corporations from around the world started working on methods on how to prevent or battle piracy. Among many such attempts were facilities that would let you enjoy free music but you couldn't download, except for a payment that you would have to make should you wish to download music offline on your phone or laptop. Among many such facilities, some of the famous ones were Saavn and Wynk Music. Talking about downloading music for listening to it offline, you could only store the music in the app, which means you couldn't simply pull it out of your app, shove it all into a USB drive, copy it on to your laptop or desktop or maybe on to your friend's tablet. No, none of that was possible for the sole reason that should these apps let you do it, the very purpose of having such services would have been defeated. People would be uploading genuine music for free on Torrents and on websites and piracy would continue to exist. Recently, among other things, Apple came with one such service too, however, with much better quality and with the guarantee of Apple. Even before the advent of Apple Music, people downloaded music from the iTunes Store – genuine music at great prices. But now, Apple Music is a replica of services like Wynk and Saavn, the only thing is that you can share it with your family members (if you are an Apple user, you probably know what I am talking about). But again, you can only keep the music to yourself. But the method applied by Apple, as you can expect, is different. It won't restrain you from copying and distributing the music. The funda was to have an altogether different file format for such music that you have downloaded on your Mac or iPhone with your Apple Music subscription. So even if you have downloaded the music, have copied it on to your Hard drive or USB drive, it's of no use to you for the sole reason that you can't play it anywhere else except on iTunes. Additionally, these files are DRM protected. The format these music files have is M4P. Hope you know what this article is all about. The M4P to MP3 Converter is loaded with features. 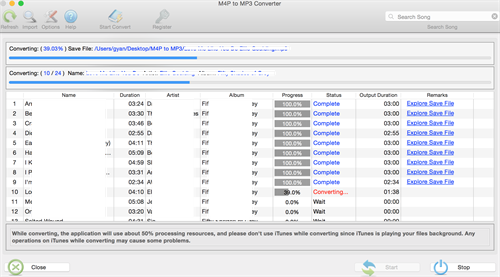 The M4P to MP3 Converter lets you remove the DRM (Digital Right Management) protection from the music you've downloaded from iTunes legally. With this application, you can remove DRM legally so you can get rid of copy-protection from these files and can load these files on other computers or digital media players. With the M4P to MP3 Converter, you don't have to worry about copyright violations or DRM protection problems again. Besides, while you do that, your ID3 tags are preserved. 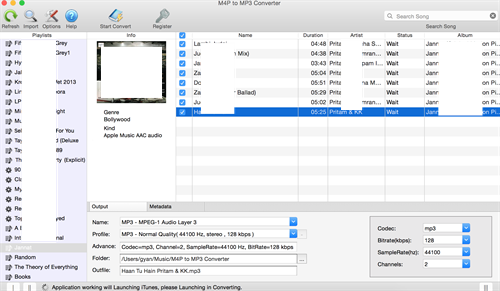 The M4P to MP3 Converter not only converts M4P music into other generally play-able formats, but also converts the Audiobooks you downloaded from the iTunes store into formats like MP3, AAC, AC3, M4R, FLAC, AIFF and MKA. So, this software is an Audiobook Converter for Mac. Now you can enjoy your favorite audiobooks on the go, anywhere. Besides, the AudioBooks chapter information is preserved in the output files, when you convert them. Besides converting DRM protected music files, you can also convert unprotected audio files into various formats. So that means you don't have to worry about converting music into desirable formats and you don't have to keep a separate app for that because the M4P to MP3 Converter does it for you. A feature that you could've easily expected on this device was Batch conversion. No, it isn't a technical jargon. All it means is converting a number of files from one format to another so you don't have to select each file one by one, set them up and do them all individually. Imaging the peril you'd bring to yourself that way? Well, M4P to MP3 Converter saves you again. 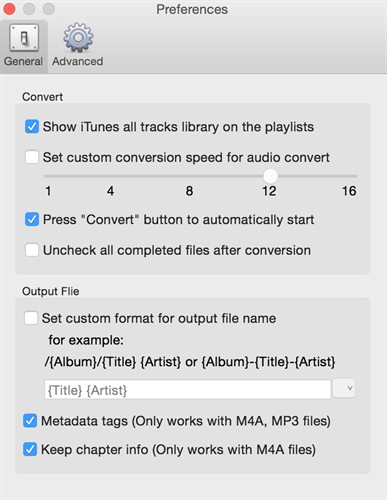 Now you can convert multiple iTunes Music Collections in one go. You can select several music files, or several playlists or even the entire iTunes Music library to convert them on a single click. 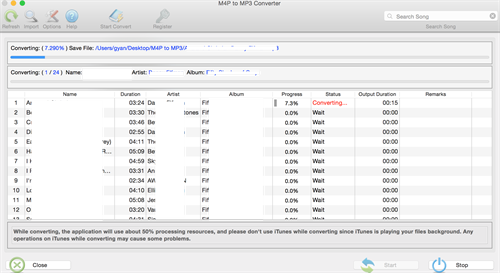 Besides, M4P to MP3 Converter for Mac offers you up to 16x faster conversion speed, a speed that the developers of this application claim would be beyond your imagination. However, you won't have to compromise with the audio quality due to such batch conversion. Worry not, thus. Here is an image that shows the files are starting to get converted. And here I have most of my M4P files converted into the MP3. Using this software for music conversion, you can adjust advance audio parameters before you get them all converted in a batch. 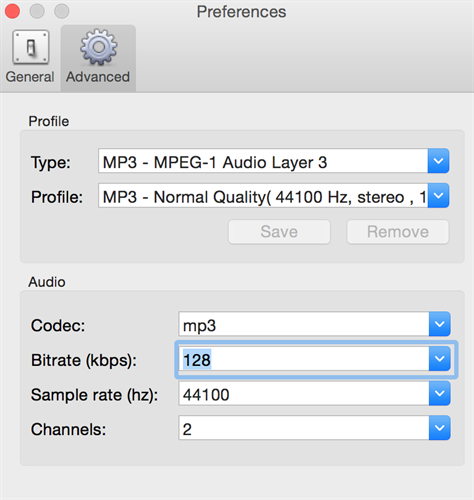 You can check and choose the bit rate for the files you are going to convert, the sample rate, the codec and the audio channels so the music you've converted are just the way you wanted. Besides, it is noteworthy that while choosing low bitrate and sample rate may save space on your disk, it may as well lower down the quality. The choice is yours; you've been given the choice. With this app, you can make custom format for the output files. You can do that in the General settings of this app. Here is a picture that shows you what to do and how to do. Not to worry about losing the tags that can with the music you downloaded through iTunes store or Apple Music. Your song name, artist, album names, artwork etc are preserved even after your music is converted. The developers claim that there will be no whatsoever loss in the quality in the converted media files. However, it is up to you. If you want to reduce the disk space that the converted files are going to take, you may as well lower down the bit rate and sample rate and that would help you save the space. But at the same time, there will be considerable loss in quality. Of course, you can't expect the app to compress the music without letting the music lose its quality at all. The best feature I found in this app was that it syncs with your iTunes without hassles. You don't even need to drag and drop music from your iTunes or media folders on your Mac. All you have to do is select music from the panel available on your next, which looks exactly like it looks on iTunes itself. You can choose the music you want to convert. Whatever could be easier? This is a premium app. And if you are an Apple Music subscriber, you don't need to explain the curiousity this article would have brought for you. Downloading music is so much fun but distributing it among all your smartphones, tablets and laptops would be so much fun especially when you're doing it the legal way. The M4P to MP3 Converter is small in size, just about some 7 megabytes. And should you be willing to avail the amazing tech support the company offers, you must download the app and register. That would however require you to pay near about $40. Using this app, I was highly satisfied. It does everything that you're assured. I would give it a 4.5 out of 10. Check out the review of the video converter software Polaris. See what this free video converting software is capable of and what other features it withholds with it.